AbaThembu acting king, Azenathi Dalindyebo, Premier Phumulo Masualle, MEC of sports, recreation, arts and culture, Bulelwa Tunyiswa and Qunu chief, Nkosikazi Nokwanele Balizulu hold up candles in commemoration of the fifth anniversary of late former president Nelson Mandela’s passing in Mthatha’s Nelson Mandela Museum on Wednesday. Photo Lubabalo Ngcukana /City Press. The Eastern Cape government has remembered one of its greatest sons – former president Nelson Mandela who died on this day in 2013. 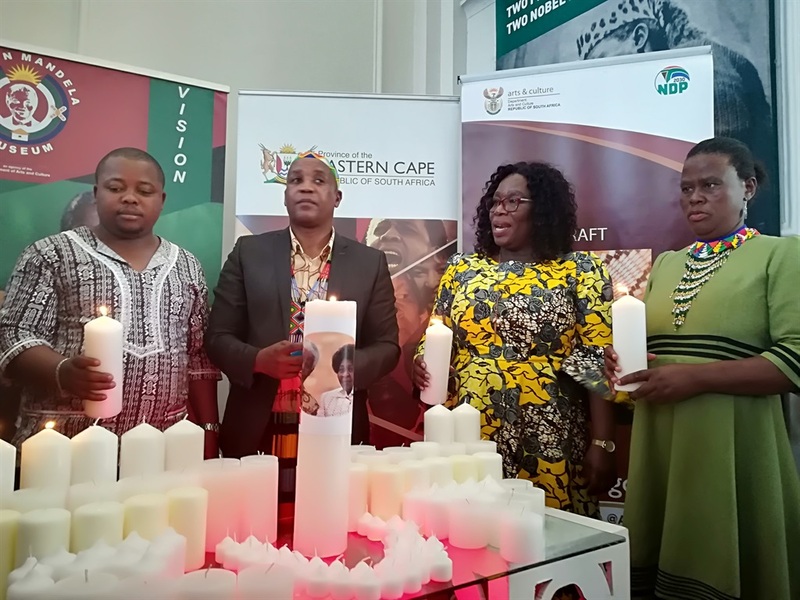 Premier Phumulo Masualle paid tribute to the global icon known fondly around the world as Madiba during the fifth anniversary of his death at the Nelson Mandela Museum in Mthatha on Wednesday. Masualle said they were consulting with the Mandela family to look at the possibility of opening up Madiba’s grave in Qunu so that it could be accessible to the public which will in turn also boost the tourism in the area. Since Mandela was buried at his farm in Qunu in 2013 only close family and friends and invited international guests who attended the funeral have seen his burial site. “We are working patiently with the family to reach a conclusion in the matter,” said the premier. The government had planned to open Madiba’s grave to the public for the first time this year as part of celebrating his centenary and increase tourism in the region but family squabbles and unresolved court cases derailed the project. Masualle, who said he had many interactions with the late struggle icon and first president of the democratic South Africa, said he would remember him for his spirit of giving. “Throughout his life and in the later years he has been the embodiment of giving, particularly to those who are in need. Madiba’s spirit was that of sharing and taking care of those who are vulnerable,” said Masualle. He said the government had done a lot for Madiba’s Qunu village in his honour, to the envy of many other parts in the province. “But I think there would still be issues with employment opportunities, even in Qunu, which would affect young people all over. But we are working very hard to make sure that around the memory of Madiba we are able to create opportunities in Qunu and the surrounding areas, particularly around his legacy and history. Madiba’s eldest grandson, Mandla Mandela, released a statement from Cape Town on Wednesday paying a tribute to his famous grandfather. “In commemorating half a decade of President Nelson Rolihlahla Mandela’s passing, we pay tribute to the generations who nurtured him, mentored him, defiantly struggled alongside him; those who were arrested and incarcerated alongside him, those who campaigned for his release; those who negotiated with him and those who triumphantly welcomed him home a free man. “All of these contributed to the man he was and the hero and global icon that he has become,” said Mandela. The Mvezo chief, who is also an ANC member of Parliament, said he missed Madiba’s broad disarming smile that instantly calmed and set one at ease no matter how heavy the burden they were carrying. “We celebrate the lessons he taught all of us; he embraced the values of selfless struggle with little hope of reward, the willingness to stand for what is right and even take great risk of personal suffering without fear of the consequences and the power of forgiveness.